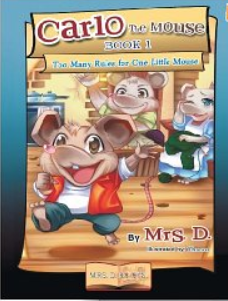 Book 4 continues the adventures of Carlo, the intrepid mouse, on his adventure in the hospital where he lives. Carlo spends most of his time dodging the hospital administrator who is determined to eliminate him. When Carlo spies a poster on the wall labeled “most wanted mouse,” he becomes indignant because he feels it doesn’t do him justice. 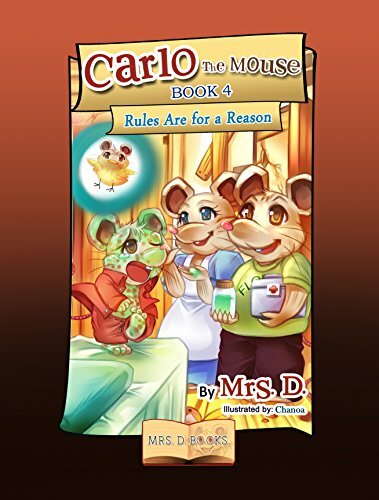 Carlo’s parents have repeatedly warned him to follow the rules, but Carlo continues to taunt the hospital chef by stealing food from the kitchen by night and watching cooking shows in the patient’s rooms during the day. One day Carlo breaks out in hives “…like popcorn bursting in a hot pan.” Carlo fantasizes how he got this disease. His mother figures it out. Carlo has spent too much time in the infectious disease part of the hospital and has contracted chicken pox. Poor Carlo takes this literally and fears that there are chickens under his skin. The book is written with humor, colorful language and vibrant illustrations by Chanoa. Elementary school-age readers will be truly entertained. Carlo learns the hard way once more why it is important to follow the rules. Maybe his young readers will take note. I received a copy of this book from the publisher and voluntarily decided to read and review the book giving my honest opinions for no compensation. Nine year old Tara is spending the summer on Gull Island at her Great Aunt Mae’s house with her mom and younger sister Jenna. Tara misses her friends. Billy, who lives next door, tries to befriend her. Tara is upset when she sees him being bullied and doesn’t understand why. Turns out Billy has a secret that he is unwilling to share. Things are slow and pretty boring until one of the staffers at the Aquarium breaks her ankle. Tara’s mother is short staffed and needs volunteers to help supervise the hatching of turtle eggs on the island. 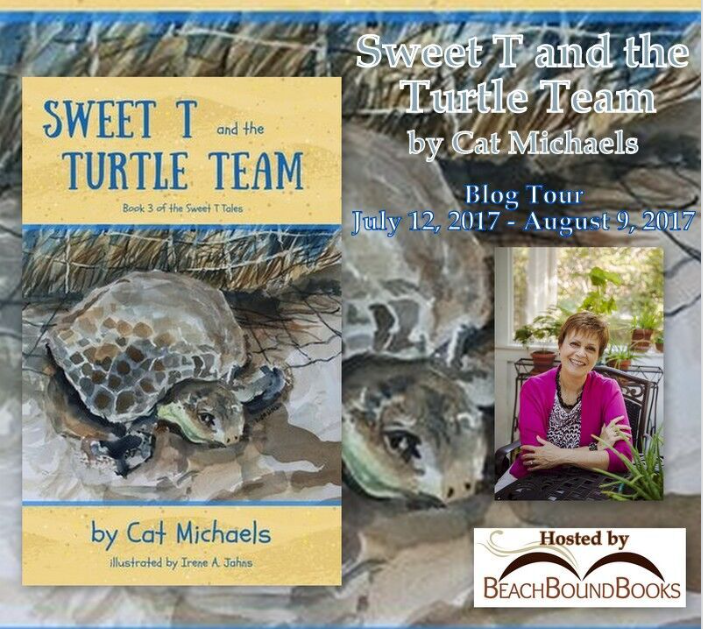 Tara, Jenna, and Billy study hard and dedicate themselves to protecting the turtle nests. But when a tropical storm named Parker threatens to destroy their charges, everyone rushes to save their mission. I enjoyed the alliteration and onomatopoeia that the author uses so effectively. At the end of each day Tara texts her older sister Kristen. This is an effective way to keep the story fresh in reader’s minds, making it a good choice for beginning or reluctant readers. Michaels also includes a glossary to explain the texting code. In addition, there are “Mind Ticklers,” questions for readers to answer about the story, as well as a few questions soliciting the reader’s opinions. This beginning chapter book targeted for children ages seven through eleven is well-written and engaging. The soft watercolor illustrations are pleasant and soothing. I recommend this book as the perfect summertime read. If you enjoyed reading this post. please subscribe by clicking on the word Follow or by hitting the orange RSS FEED in the upper right hand corner of this page. First book in a middle grade short story series. Lilah is about to celebrate her thirteenth birthday. Her father surprises her with her favorite breakfast of pancakes and bacon. As she departs for school with her older brother, Jay, Lilah looks forward to her first class in which she is studying about Ancient Greece. Mr. Fisher is discussing the Olympians. For some reason, Lilah can’t stop thinking about the lesson. 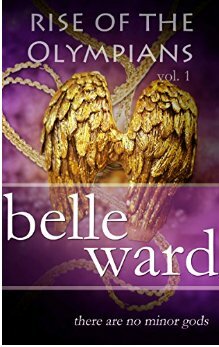 When Lilah gets home she is surprised by the gift of an angel-winged necklace from her dad. But when she prepares for bed, strange things begin to happen. The necklace heats up, her rainbow colored extensions suddenly become attached to her head, and she experiences a strange dream. The next day, Lilah is invited to join a special dream club. She is astonished to learn that the other members are Apollo and Hades. They think she is the goddess who will help them find the Father of the Monsters. A sudden crash, and all must run for their lives…..Will Lilah cast her fate with these strangers? Will she wake up from this nightmare? This short story is a good length for reluctant readers. The characters are believable and interesting enough. What some readers may not like is that the tale ends in a cliffhanger. Readers will be left disappointed unless they immediately get a hold of Book Two. More trouble afoot in Friendship Bog and the surrounding swamps. Kidnappings, poisoning and floods are in store for the animal inhabitants. Our frog friends, Pibbin and Leeper go on a mission to help young rabbits that have been poisoned by a mysterious orange berry plant. They must search for the only known cure, the gel from the Gummy Bark to counteract the poison. Keena, the nefarious lizard, is suspected to be behind it. In the meantime, Carpenter frog has disappeared from his workshop so Pibbin and Tatter go to search for him. Along the way it is discovered that the beaver are having a problem with the skinks and Cheeco the Chipmunk is also missing. As the search continues, our investigators discover a mysterious map that they hope will be a key to solving the mystery. The beavers come up with a plan to rid themselves of Keena, the lizards, and the skinks, but will their plan work or will it destroy their homeland in the process? Lots of adventure and twists and turns mixed with lessons for young chapter book readers. 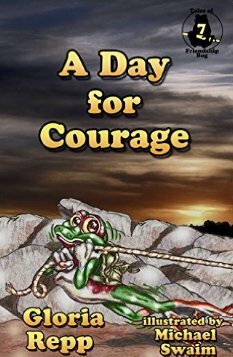 Our frog friends teach courage, bravery, and standing up for the rights of others. Cooperation is the only way to success, and there is value in taking risks when the ultimate aim is to make life better for all concerned. Readers age seven and older who like animals, adventure and reading a series should enjoy all the books about life in Friendship Bog. If you enjoyed reading this review, please subscribe by clicking on the word Follow or by hitting the orange RSS FEED button in the upper right hand corner of this page. This is the second book in an epic fantasy series. I did not read the first book, and so it took me a while to get my bearings and catch the drift of what was transpiring. In the opening chapter, a woman in a cistern has taken the form of Anna. She informs Kell, Longo and Wandfala that there will be 99 days and nights of rain. The earth will soon perish. Gavial and Anna are now prisoners; the previous victories over the Bone Dragon are deemed worthless. Master Kell is a Holy Paladin who is in a state of communion. Wandfala tells Longo that it will be up to him to rebuild their ship, Chaos, if they are to continue their quest. The trio will sail to an island where the tree of life resides to seek the blessing from the Angel of Life in order to challenge the witch Monmalla. Along their journey, they will encounter sea creatures with green hair, a swarm of vermin, black crows, and a mysterious young boy with a sense of humor who taunts them for their foolishness and stupidity. Will the three travelers succeed in their mission to rescue Anna? Where will the time travelers land next? I would strongly suggest reading this epic fantasy, science fiction series in the correct order to understand the nuances of the plot. These tales are short, but require careful reading. 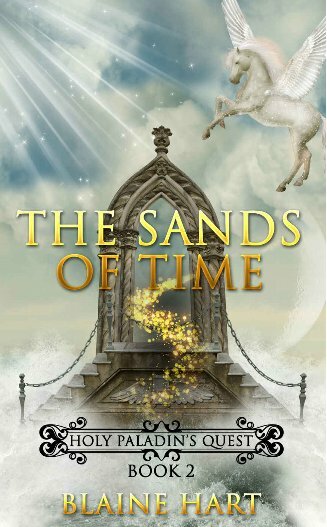 Suggested for fantasy and time travel devotees age ten and older. This is the first of a series of adventures involving Carlo. In the first book, Carlo has just been born in Hospitalia, Florida. He lives with his parents behind the walls of the hospital. Carlo is always hungry. He dreams of exploring the kitchen where the chef concocts international dishes, but his parents are eager to protect their curious child. Carlo asks them if they could move to Italy, France, Germany or any foreign country so that he could sample its cuisine. Carlo continues to pester his parents. Finally, the day comes when they agree to let him explore the halls of the hospital. However, they give him five rules that he must always follow. He must always be neat, avoid the manager’s office, only visit patients who are watching cooking shows, stay away from the infectious disease ward, and never visit the kitchen! Of course, you can guess Carlo will experience enormous difficulty following these rules, especially the last one. With tears in their eyes, the protective parents watch as Carlo ventures forth to explore wearing the sweater that his mother has just knitted for him. 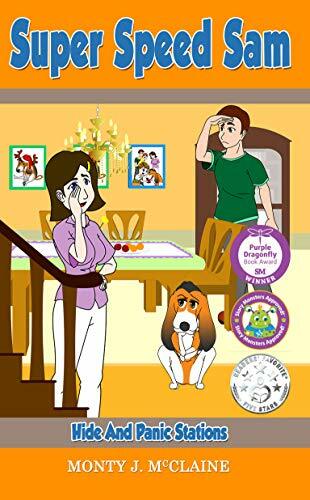 The series is previewed at the end of the book and promises to be a set of exciting adventures matched with lots of lessons for young children to learn. Chanoa has done a wonderful job with the illustrations which are, at the same time, soft and bold. The personalities of the characters shine through the page. Carlo reminds me a bit of Despereaux minus the big ears. This book makes a great read aloud for parent or teacher and invites discussion among adults and children. Recommended for ages three and above. Looking forward to meeting Carlo again in Book Two as he begins his tour of the hospital.